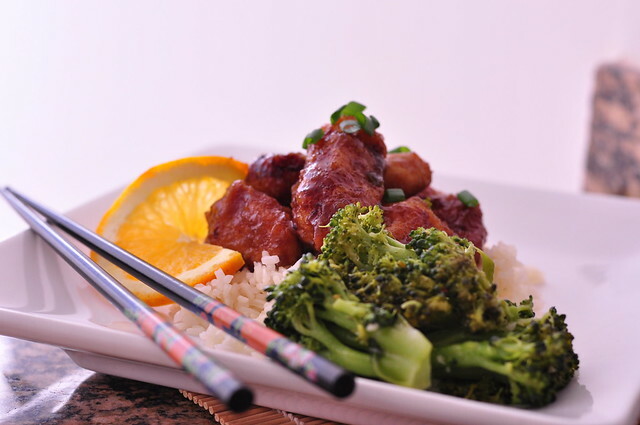 Last week, I set out to make a dish I'd never before eaten: Orange Chicken. Or, if you want to put on your Chinese accent, "O-hange Sheek-un." Although I do enjoy most Asian cuisine, I've never been tempted to order the typical dish that included questionable cuts of meat, fried, then smothered in an unnaturally-colored sauce. Soooo....why, would I want to try the recipe, you ask? Well, this one actually sounded...good! You do still fry the chicken, and cover it in a savory-sweet sauce, but I feel certain I can guarantee this is far better than any take-out in a box. 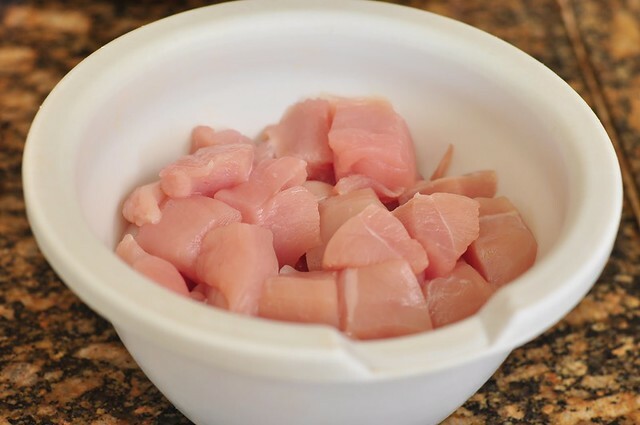 Start with about 2 lbs boneless, skinless chicken breasts (or thighs), and cut them into 1 1/2" cubes. In a large saucepan, combine 1 1/2 cups water, orange juice, rice vinegar and soy sauce. Blend well over medium heat for a few minutes. Stir in brown sugar, zest, ginger, garlic and red pepper flakes. Bring to a boil, then reduce heat, and let simmer while you fry the chicken. In one dish, combine starch, salt and pepper. In the next, put the beaten eggs. In the last, the panko. Working assembly line-style, dip the chicken in the eggs. Then dredge in the corn starch. Dip again in the eggs, and finally, in the panko. This double-dredging method makes for a nice, crunchy batter than will hold up to the coating of the sauce. 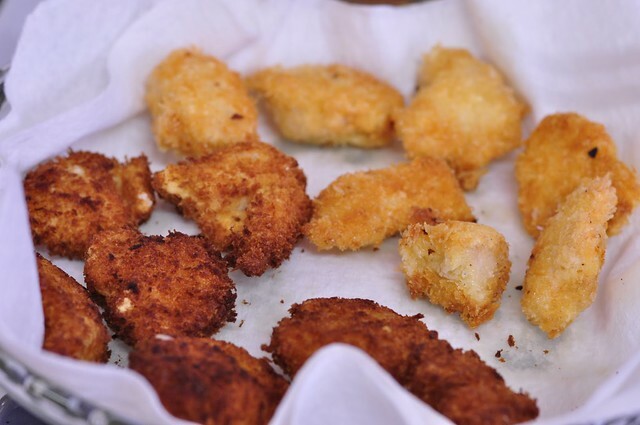 Place chicken (in batches) in a single layer in a frying pan with the oil heated to 375 degrees. Here's where it's good to know your range, and when oil hits ideal frying temperature. I started frying before my oil was hot enough, and my first batch of chicken was only slightly golden. However, I over-adjusted, and my second batch was a little too brown. Somewhere along the way, I got it just right. Keep chicken warm in a low oven while you prepare side dishes. I served Basmati rice and lightly-sauteed broccoli. 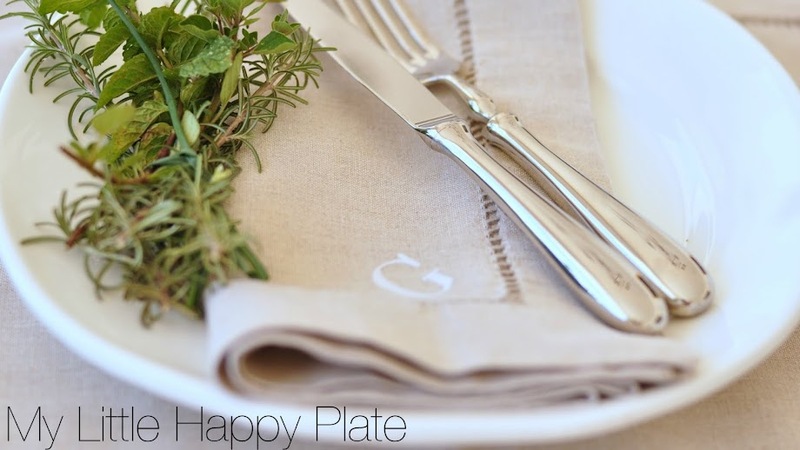 Shortly before serving, combine 3 tablespoons of cornstarch with 1 cup of cool water and mix thoroughly. Slowly stir mixture into orange sauce until it thickens. 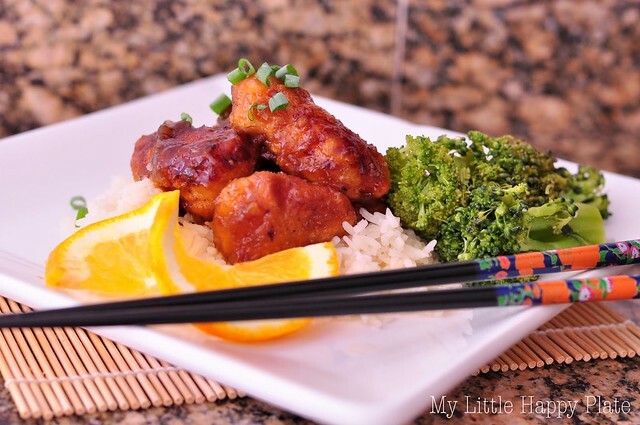 Pour sauce over breaded chicken, and garnish with green onions. Ben and I kicked it up with Sriracha hot sauce, and I think it was a perfect addition, but for the kiddos, we kept it mild. Now THAT was an Orange Chicken I could order up! That looks exactly like what my husband orders at our local chinese. Every single time. I will definitely be trying this, hopefully I can convince him I DIDN'T order take out!